Abstract: We often are asked questions about testing installed fiber optic cables that indicate the industry standards are confusing, have little information on measurement accuracy and no guidelines for troubleshooting. This web page is an attempt to clear up some of this confusion. But remember, as Bob Metcalfe, co-inventor of Ethernet, says, "Standards are wonderful, because we have so many to choose from!" 6 Ways? It has been said occasionally that there are in foct 6 ways - if you include single-ended testing used for patchcords. That's true, and this method is used to troubleshoot bad connectors on cables by testing each end separately, but the loss of a cable plant must be done "double ended" as described here. Update: The old TIA OFSTP-14 was replaced by a new ISO standard. The TIA has adopted IEC 61280-4-1 as the replacement of OFSTP-14. Most of the two documents is the same, with some important exceptions. • For insertion loss, three reference methods are are still approved, but the nomenclature is different - no more "Method A, B or C" designations- it's now 1, 2 or 3 reference cables. • OTDR testing is now an approved second tier test method as long as you use both launch and receive cables. • Reference test cables with "reference grade connectors" are recommended. 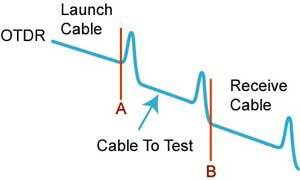 • Methods are given for testing and verifying the loss of reference test cables. • For multimode modal control, CPR with a mandrel wrap is gone, at least for 50/125 fiber at 850nm, replaced by "Encircled Flux," a complex - and not completely debugged - method of measuring the source output. Most of the changes are nomenclature. In the meantime, continue testing as usual. There are five ways listed in various international standards from the EIA/TIA and ISO/IEC to test installed cable plants. Three of them use test sources and power meters to make the measurement, while the fourth and fifth use an OTDR. The best way to understand them is to look at the diagrams below. The source/power meter method, generally called "insertion loss," approximates the way the actual network uses the cable plant, so one would expect the loss to be similar to the actual loss seen by the network, which is preferable. The OTDR is an indirect method, using backscattered light to imply the loss in the cable plant, which can have large deviations from insertion loss tests. OTDRs are more often used to verify splice loss or find damage to cables. The differences in the three insertion loss tests are in how we define "0 dB" or no loss. All three tests end up with the same test setup (Figure 1), but the reference power can be set with one, two or three cables as shown in the three setups below. All four methods have measurement uncertainty. After we explain the methodology, we will examine the measurement uncertainty. Insertion loss testing with a test source and power meter simulates the way the cable plant will be used with an actual link. The test source mimics the transmitter, the power meter the receiver. But insertion loss testing requires reference cables attached to the source and meter to connect to the cable under test. 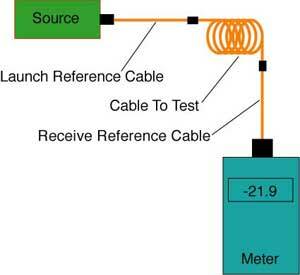 This insertion loss test can use 1, 2 or 3 reference cables to set the “zero dB loss” reference for testing. Each way of setting the reference gives a different loss. The reason for the existence of three methods is the compatibility of test equipment to the cable plant; whether the test equipment has connector interfaces that allow direct connection to the cable under test. If the test equipment has connectors compatible with the cable plant, a one-cable method can be used. If the test equipment does not have connectors compatible with the cable plant, a two- or three-cable method must be used. If the test equipment does not have connectors compatible with the cable plant and the connectors are the “plug and jack” or “male, female” type, a three-cable method must be used. It all depends on the connectors on the cable plant you are testing and the connector interfaces on your test equipment. And some history. The 1-cable method has always been the method of choice because it does not require compensating for the connections in the reference cables when setting the "0dB" reference. It's like we discussed measuring transmitter power above. You measure the output of the launch reference cable, connect it to the cable plant under test, launch power through that first connection and measure the loss of all losses in the cable plant. The meter connects to the cable plant at the far end with a receive reference cable, and when the meter makes it's measurement it includes the connection of the receive reference cable. Thus both connections on each end of the cable plant are measured, Just like the actual link will work in operation. No corrections are needed. But suppose you have a LC cable plant and your instruments have SC connector interfaces? Or suppose 35 years ago, you test set had SMA connectors and you needed to test a cable plant with Biconics. (Don't know those connectors? Look them up here.) You can use hybrid reference cables with SMA connections on one end for your instruments and Biconics on the other end to mate with the cable plant. Use a biconic mating adapter to set your reference - including that connection - and make measurements remembering - or ignoring - that your reference value included one unknown connection. Or suppose you are trying to test connectors that do not match the connections on your instruments nor do they mate with each other because they are gendered - male/female or plug/jack? Hybrid reference cables won't help here, so you go to a "cable substitution" test. Set up your instruments with hybrid cables and set your reference with a third cable that is a short version of the cable plant you want to test. Since most cable plants using plug/jack connectors (like a MPO prefab cable plant or multipin military connectors) have the permanently installed cable plant end in connectors of the same gender (MPO jacks are connectors with pins), you will have your instruments with similar cables and the reference cable will have the opposite styles of connectors to mate with them. Just remember that you will make measurements that yield different loss values depending on the reference method you use. All three methods are approved in most standards and at least the 1-cable or 3-cable methods are approved in all standards we're aware of. Generally network standards prefer the 1 reference cable loss method, but that requires that the test equipment uses the same fiber optic connector types as the cables under test. If the cable has different connectors than the test equipment (e.g. LCs on the cable and SCs on the tester), it may be necessary to use a 2 or 3 cable reference, which will give a lower loss since connector loss is included in the reference and will be subtracted from the total loss measurement. Any of the three methods are acceptable, as long as the method is documented. Be careful, however, as most network link losses may assume a 1 cable reference, which can affect the acceptance of the cable plant. It is important to understand that the three reference methods will give different loss readings because of the connections included when setting the reference with 2 or 3 cables. Here is an explanation of the differences in loss readings you will see with each method. 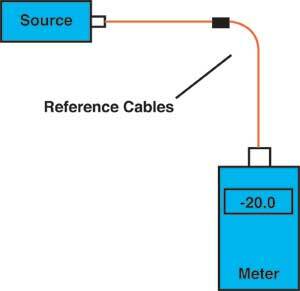 This method uses only one reference cable attached between the test source and the power meter. The meter, which has a large area detector that measures all the light coming out of the fiber, effectively has no loss, and therefore measures the total light coming out of the launch reference cable. Once the reference is set, the launch reference cable should not be removed from the source, as it may have a different coupled power when reattached. When the cable is tested as shown above, the loss measured will include the loss of the reference cable connection to the cable plant under test, the loss of the fiber and all the connections and splices in the cable plant and the loss of the connection to the reference cable attached to the meter. It is important to note with all these tests the quality of the reference cables is important in the uncertainty of the measurement. If one uses reference cables with bad connectors, the losses when mated to the cable under test will be higher than they should be, not a good result if you want the installed cable to show the quality of your installation processes! Installers should test all reference cables using FOTP-171 single-ended cable tests to ensure their quality. Cables with losses higher than 0.5 dB per end should be cleaned and retested, then discarded if they do not meet the 0.5 dB max loss. Dirt is always another issue. If any of the connectors are dirty, measurements will show higher loss and more variability. This method probably evolved from the telcos where lengths were long and the instruments were brought together only once a day for calibration, plus instruments often had connectors different from the cable plant (e.g. biconics on the cable plant and SMAs on the instruments.) Here the launch reference cable is attached to the source, the receive reference cable to the meter, then the two cables are mated to set the reference. Once the reference is set, the launch reference cable should not be removed from the source, as it may have a different coupled power when reattached, and one should probably do the same at the meter. Setting the reference this way includes one connection loss (the mating of the two reference cables) in the reference value. When one separates the reference cables and attaches them to the cable under test, the dB loss measured will be less by the connection loss included in the reference setting step. That's approximate, by the way, since the variations in mating alignment make the loss slightly different each time two connectors are mated. Anyway, this method gives a loss that's less than the 1 cable reference, Method B (above) and because one connection is included in settting the reference, it has a higher variability. Dirt is always an issue. If any of the connectors are dirty, measurements will show higher loss and more variability. If the connectors are dirty when setting the reference but cleaned afterwards before testing the cable, one gets a lower loss, or even a gain! Why would you use this method? If your test equipment has different connectors than the cable under test, but the connectors are all mateable with proper mating adapters, this method can be used. Some of the newer connectors are male/female or plug/jack, not two males that use a mating adapter to create a connection. One connector is used on the jack in the wall or patch panel and one is used on a patchcord. Examples are the MTP and MT-RJ. These connectors cannot be mated to test equipment nor can two similar ( plug or jack ) be mated with a mating adapter. Reference cables generally will be patchcords with plugs while the cable under test will have jacks on either end. The only way to get a valid reference is to use a short cable of known good condition as a "stand-in" for the cable to be tested to set the reference. 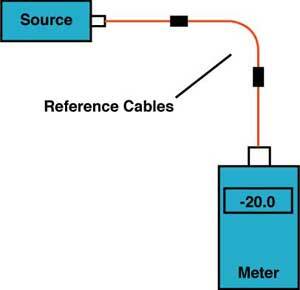 To test a cable, replace the reference cable with the cable to test and make a relative measurement. Obviously this method includes two connection losses in setting the reference, so the measured loss will be less by the two connection losses and have greater uncertainty. Dirt is again an issue. If any of the connectors are dirty, measurements will show higher loss and more variability. If the connectors are dirty when setting the reference but cleaned afterwards before testing the cable, one gets a lower loss, or even a gain! Why would you use this method? If your test equipment has different connectors than the cable under test and the connectors on the cable to test are not mateable, this method can be used. Since this method works with any connector style, it has been chosen for several international test standards. Since there is some confusion about what each method actually measures, the FOA has a web page that explains it in simple diagrams and math. Read Loss Math. OTDRs (right) test from one end of the cable using the backscatter signature of the fiber to make an indirect measurement of the fiber. OTDRs always require a launch cable for the instrument to settle down after reflections from the high powered test pulse overloads the instrument. 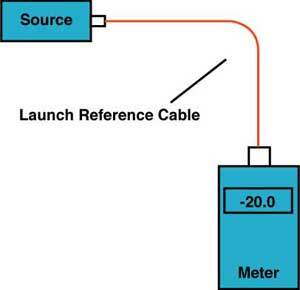 OTDRs have traditionally been used with long distance networks where only a launch cable is used, but this method does not measure the loss of the connector on the far end. Adding a cable at the far end allows measuring the loss of the entire cable, but negates the big advantage of the OTDR, that it makes measurements from only one end of the cable, since a tech is required to attach the receive cable to each fiber as it is being tested. More on OTDR testing. 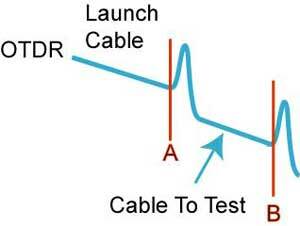 When testing with an OTDR using only the launch cable, the trace will show the launch cable, the connection to the cable under test with a peak from the reflectance from the connection, the fiber in the cable under test and likely a reflection from the far end if it is terminated or cleaved. Most terminations will show reflectance that helps identify the ends of the cable. This method does not, however, test the connector on the far end of the cable under test because it it not connected to another connector, and connection to a reference connector is necessary to make a connection loss measurement. If a receive cable is used on the far end of the cable under test, the OTDR can measure the loss of both connectors on the cable under test as well as the fiber in the cable and any other connections or splices in the cable under test (not shown.) The placement of the B marker after the connection to the receive cable means some of the fiber in the receive cable will be included in the loss measured. Most OTDRs have a "least squares" test method that can subtract out the cable included in the measurement of a single connector, but this will not work on a double ended cable loss test. So just how much does the loss of a cable plant change with the different methods? The table below shows test results for a 520 meter simulated cable plant with multimode 62.5/125 fiber tested four ways at 850 nm using several different sets of reference cables to see the results. Unfortunately, we did not use a receive cable to get data for the fifth method mentioned above, but we did take data in both directions. Using 10 different sets of reference cables and making multiple measurements allowed calculating an average of each measurement, comparable to what several different test crews might find, plus calculating the standard deviation, a statistical indication of the repeatability of the measurement. Note how the loss of our test cable plant reflects the comments we made above. The one cable reference method has higher loss than the other methods, but it also has much less measurement uncertainty (standard deviation.) The 2 and 3 cable reference methods have less loss because we have subtracted the connector loss(es) included when we set the reference for 0 dB loss, and the uncertainty is higher because of the greater variance when connected to the reference cables. And the OTDR measurement is significantly lower than the other three methods plus is 0.14 dB different according to which direction we are testing in. Note that if we added to the OTDR loss the average connector loss difference in the other tests, about 0.25 dB, the loss would still only be about 2.1 - 2.2 dB, significantly less than any of the insertion loss tests. If you want to read more about what each insertion loss method actually measures and why the uncertainty is different for each method, the FOA has a web page that explains it in simple diagrams and math. Read Loss Math. What is the loss of this cable plant? Well all four of those measurements are strictly according to international standards, so you can take your choice! However, it might cause a problem if you attach some network electronics. Most network specifications have been written around a loss test that uses a one cable reference method, as does the EIA/TIA 568B test method. If your cable has been tested with any other method, the lower loss you measure will give you a false measurement of system margin. If you are dealing with new, fast networks like Gigabit Ethernet or Fibre Channel which have much smaller operating power margins, you could be in trouble. The different loss obtained in OTDR measurements comes from it’s completely different methodology. OTDRs use backscattered light to imply the measurement while insertion loss is measured directly by transmission. All OTDRs use laser sources which inject light generally only in the center of the core of the fiber where loss is lower. Some claims for using mode conditioners to make OTDR and insertion loss data correlate has not proven reproducible in independent tests conducted by the FOA (Read the report here.) A single-ended OTDR measurement, which most tech use, does not test the connector on the far end. Recent standards mention and sometimes require a receive cable for OTDR tests, which would have added 0.2-0.3 dB to the loss measured in the test detailed above. But having to use a receive cable with an OTDR negates its advantage of being able to be tested from one end by a single technician. Which Test Method Should Be Used? For insertion loss testing, it depends on the types of connectors on your test equipment and the connectors on the cables you need to test. If your cable plant has the same connector styles as your test set, or all the connectors use the same 2.5 mm ferrule style common to ST, SC, FC and some other connectors, you can use the one cable reference method. If your test equipment has ST or SC connectors and you must test LCs on the cable plant, you may have no choice but to use a 2-cable reference or 3 cable reference. To compare these test results with a 1 Cable Reference, you must add an estimated loss for the connector included in the reference measurement, say 0.3-0.5 dB for a typical connector on a high-quality factory-made patchcord. If your test equipment has ST or SC connectors and you must test duplex male/female connectors like the MT-RJ on the cable plant, you may have no choice but to use a 3-cable reference. To compare these test results with a 1 Cable Reference, you must add an estimated loss for the connectors included in the reference measurement, say two times 0.75 dB for a typical MT-RJ connector on a high-quality factory-made patchcord. More on testing cables with different types of connectors. *The 2 Cable Reference can be used if the connector under test can be adapted to the connector interface on the test set – e.g. a tester with SC interface, but ST and FC can be mated to SC with a hybrid mating adapter, so SC reference cables can be used. Testing cables with different types of connectors.